I enjoy reading other people’s understanding of embodied cognition and its relevance to our day to day interactions. Mark Johnson said somewhere that their work is at once obvious and deeply profound. We are so embedded in understanding the abstract in terms of the concrete that most people cannot see there are alternative ways of seeing; hence they dismiss the work. In their work on how even maths is metaphorical in nature, I marvelled at their gift to see below the surface of words. It has given me a great respect for the small cues in language that speak of this hidden realm. Yet, as you say, just talking about this does not help us embody change. I used to run workshops to teach people how to ‘see’ in this new way as my PhD was about that. It was a joy to see the discovery process and the change in the quality of conversation when a new way of structuring their inner world was tested…. Without the experiential, often this work on metaphorical understanding stays at the level of the quaint; like ‘did you know the Eskimo have x number of words for snow?’ With metaphor it would be ‘did you know that the whole of social life is structured with the ‘time is money’ metaphor?’ No more than dinner conversation until we try to embody something else. 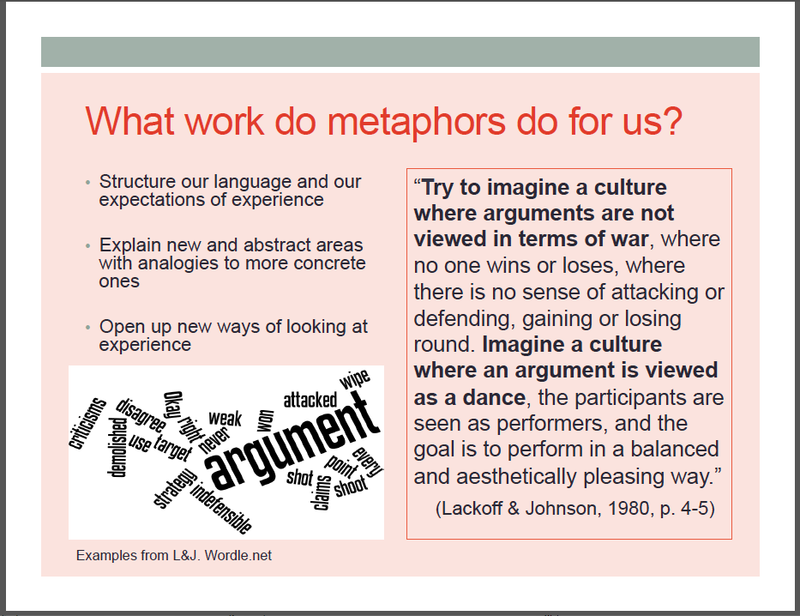 We do need different metaphors for how we do life, not just education in my view. How we do the inner work required to embody these in our dialogue is quite another story….thanks for this post, so clear. Many thanks Mariana for your comment. I agree that we also need the experiential. I think that often in conferences this is given lower priority or that may simply be my perception. Do we need more workshops at conferences? There was some discussion about the relationship between theory and practice at the conference. The Networked Learning Conference has a reputation for high quality papers which do not shy away from theory. A number of people said that they liked the conference because of this emphasis on theory, but the point was also raised that maybe practice-based papers should be given more space (my words and interpretation!). My own paper that I wrote with Jutta Pauschenwein was practice-based, and when submitting I did wonder whether it would be accepted because of the emphasis on practice instead of theory. Hope this makes sense. Thinking off the top of my head here! I want to tell that I’ve begun to read yours and Jutta’s post during NLC2016 and I enjoy. Hi Heli – thanks so much for leaving a comment here. I had noticed you following the Networked Learning Conference on Twitter, so it’s good to see you here. Yes – there was a lot in Caroline’s keynote and, of course, metaphors are never straightforward, so it’s not surprising that you have revisited these ideas. I have only scratched the surface myself. Hope all is well with you Heli.